Place the sweet potatoes in a large saucepan and cover with water. Bring to a boil. Reduce heat, cover with water. Bring to a boil. Reduce heat, cover and simmer 30 minutes or until tender. Drain. When cool enough to handle, peel potatoes and cut into 1/2-in. slices. Preheat oven to 375 degrees. 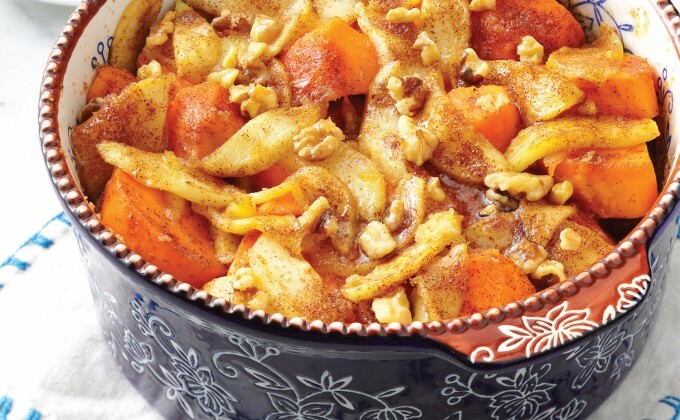 In a small bowl, combine brown sugar, walnuts, cinnamon and salt; set aside. In a large skillet, saute apples in 2 tablespoons butter 3-4 minutes or until tender. In a greased temp-tations® 1.75 quart baker, layer half the sweet potatoes, apples and brown sugar mixture. Repeat layers. Dot with remaining butter. Cover and bake 30 minutes. Uncover; bake 15 minutes longer or until bubbly.